Name, age, hometown: Emily Ripley, 15, Middleton, Wis. What corps are you in and what is your role this summer? 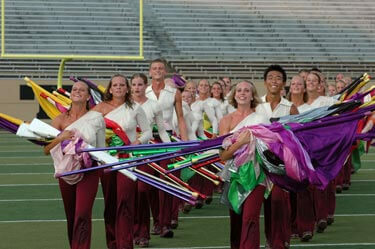 I'm marching with the Colts this summer in the color guard. Where I go to school and what I'm studying: I go to Middleton High School, but I'm working on preparing myself as a performing arts, theater arts or dance major. Give us your full drum corps/marching music background: I started doing color guard when I was nine. I was in a small summer group called the Academy Youth Guard in Arizona. Academy Youth Guard is now the Academy Drum and Bugle Corps. I did that for two years, and then my family moved to Wisconsin where I marched with Capital Sound in 2003. I proceeded to audition for the Colts, and there I am and there I stay. What's your practice schedule like? The Colts have camps once a month where we get together for a weekend and rehearse like mad-men. At the end of those camps we put on a small show on Sunday for family and friends. Starting in April, there are two of these camps a month, but at the end of May we go on the "Cornfield Tour" which is basically a week or two of long rehearsals and learning the show. After that, the regular tour begins! What does your ideal free day consist of? Free days aren't really free days. They are free nights or afternoons. We usually get up a little later than usual (9 a.m. instead of 8 a.m.) and rehearse until 1:30 p.m. when we break for a late lunch. After lunch, we either head for the free day or rehearse for a few more hours before leaving. Favorite pig-out food: On tour, I love gummy bears. My seat partner's parents would always send 10 pound bags of gummy bears, and we'd pass them around the bus all night long. Yum! In the shower you can hear me singing: I tend to sing old Britney Spears songs or Disney songs like "A Whole New World" from "Aladdin" and "Part of That World" from "The Little Mermaid." The last good book I read: I recently read "Flowers for Algernon" by Daniel Keyes for my English class. I loved it! The last great film I saw: "Rent" was so awesome! Jobs I have/have had: I baby sit twice a week. Does that count? Haha, I have no time for a job with my schedule. My favorite TV show: I like "Whose Line Is It Anyway?" on ABC Family or "Made" on MTV. What would you be doing next summer if you were not marching? Probably dancing a lot and learning to drive. There are also several summer theatre groups that I would love to participate in, but drum corps is better, hehe. How did you decide to be a member of your corps? I didn't really have a choice. Capital Sound folded at the time I was marching with them, but I still really wanted to march. My mom wanted me to march. So, being 13, I naturally had no say in what I was to do. My mom told me that I was going to audition for the Colts and off I went. What first attracted you to the drum corps activity? I knew what drum corps was before I knew what drum corps was. My mom was the director of Arizona Sun (an old Division II corps) for the first four years of my life. I've been inspired by and destined for drum corps ever since. What advice would you give to young people who want to march? Do it! Drum corps is an indescribable experience that teaches you respect, maturity, responsibility and discipline. It shows you that you can do anything--absolutely anything--if you put your heart into it and believe in yourself. But, they must know that you have to start small or just get really good at what you do before you audition. You can't expect to make a corps the first time you audition either. They should think of it this way. First of all, auditioning for a corps is a risk and you should congratulate yourself for even trying if you do try out. But, if you don't make it into a corps, it's not the end of the world! You either earn a spot and have an insanely amazing summer, or you don't make it and have the awesome summer that you would've had if you were too chicken to audition. Second of all, to actually want to run around in the hot sun all day long and become physically fatigued and tired until you're numb is pure insanity. You should know that if you join a corps, you will be considered crazy. Prepare yourself in knowing that your friends will think you are an idiot, have lost your sanity and have completely abandoned them. Not to mention, your friends will be jealous of your new found corps family. But, they get over it, and so do you after you realize what you have accomplished. What I want to be when I "grow up": I want to be on Broadway! Performing in musicals and theater productions is my dream, and I am determined to fulfill it. Even with all my determination, if that doesn't work out, I am very interested in the human mind so a psychology major is very intriguing. Best drum corps show ever and why: There are so many of them! One that comes to mind was last year's Kalamazoo major event. It poured and poured, or at least it did right before we went on to perform. I'm pretty sure that it did for a few minutes during our show too. I remember being so scared that I would drop or slip or something terrible would happen, but it was a major event so I gave it all I had. It was one of those shows where you can feel how good it is. You can just feel it in the corps as you perform, everyone is together and everyone is putting out the same amount of energy as everyone else. The rain comes down and you squeeze your flagpole until your hands are raw and hit every hit with incredible strength and energy. I look up to the audience that is half gone because it's down pouring, but the few that are there are smiling and cheering, and I can hear and see them. I look to my right and see a judge watching me, and I know that he can't find one thing wrong with me at that moment. I think if that judge cannot feel the corps' energy and see how bad we wanted it at that moment, then he's not a true judge. It's an indescribable rush. The show ended and as I picked up my equipment I started to cry, only to see everyone else crying. We all felt that show and the intense energy that we put on the field that night. It makes me wonder why every show can't be like that one, but it was something about the rain that made that show amazing. I'll never forget it. The year is 2030. What does a DCI show look like? History tends to repeat itself so maybe people will march with marimbas again or something like that. As far as color guard goes, I can see lots of different equipment being used, and I can imagine there being stages or some kind of flooring brought out so dancers can go on "point" and do things that are difficult to complete on grass. Drill will probably be insane--just insane--because it already is, so creativity will continue to skyrocket. The poor horn line and drum line members will have no knees left by the end of the summer from so many direction changes and sprinting moments. The front ensemble will introduce more instruments to the ensemble as the years progress, and drum corps as a whole will become more and more like a Broadway production.